what matters NOW (in print)! 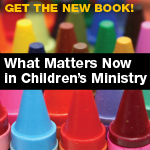 i’m thrilled that our what matter’s now in children’s ministry eBookis now available in print! our desire increating this book was for as many people as possible to access the book in order to encourage conversations around what really matters now, for our children, for our families, and for our churches. it’s been an absolute thrill to hear the conversations, and specifically to hear what word you are choosing to describe what matters most right now. and so, we thought the best way to spark the most conversations was to make the book available in multiple formats. so that’s why today, the print version of what matters now in children’s ministry is available! and of course, imago once again did the design – so it looks fabulous! we’re excited about the possibilities the print version will allow for further conversations. i’m planning to use it with groups i’m consulting, as a training exercise at conferences, and as a starting conversation with brand new volunteers! but, i’m curious how you will use the print version of the book. and of course, i’m always interested in the word you would chose right at this moment to describe what really matters.